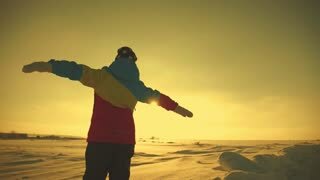 Romantic girl dreams about the flight, while standing on the mountain’s rock, a bright sunshine on the background. Calm girl is meditating in the mountains, bright sunshine on the background. 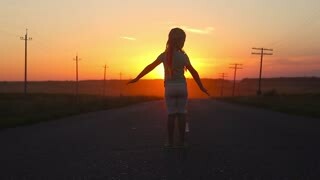 Silhouette of a beautiful girl standing against a sunset on the road, hands like wings for a flight. 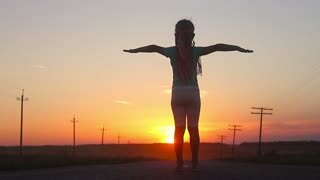 The concept of dreams is to learn to fly and freedom. 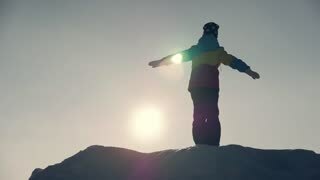 Silhouette of a girl standing on top of a snow-covered mountain lifestyle, a concept of dreams and travel. She dreams of traveling.